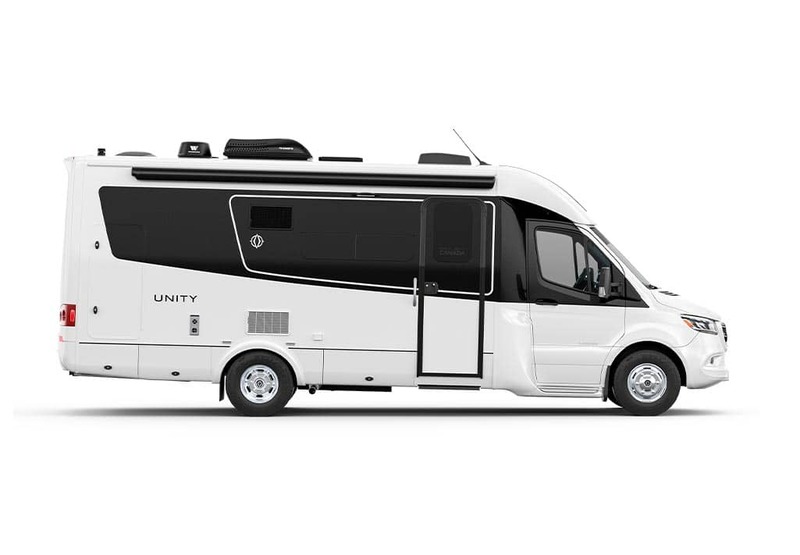 More than 9,200 miles in our Leisure Unity MB. Nine comfortable weeks. And, with two cats, comfortably in their beds. It was quite a trip. But, what a trip. We began with the goal of meeting my grown children and grandkids in northern California. One lives in California, the other moving to Mexico. 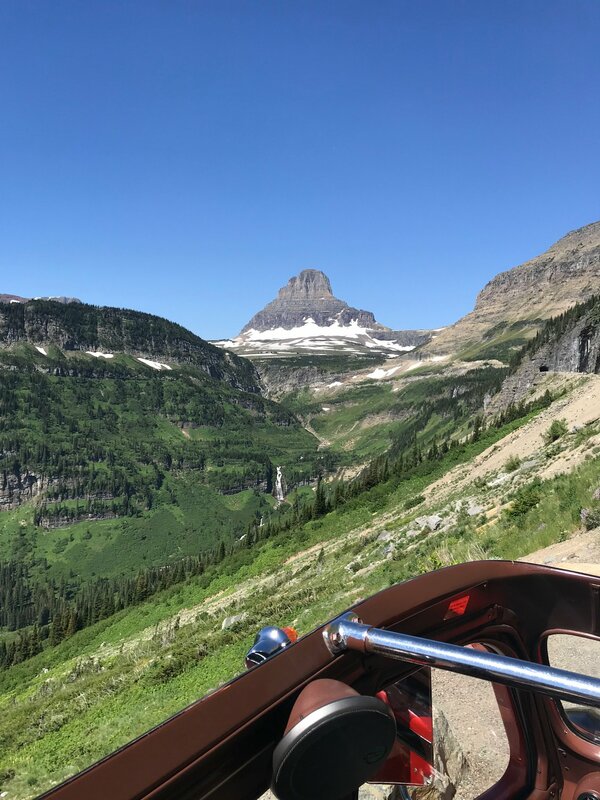 We had a timeline that would take us into the prairie of Minnesota, then North Dakota, into the Rockies at Glacier National Park, then north to the Canadian Rockies. And, here’s how. Here’s also hoping that you too can plan a trip like this. 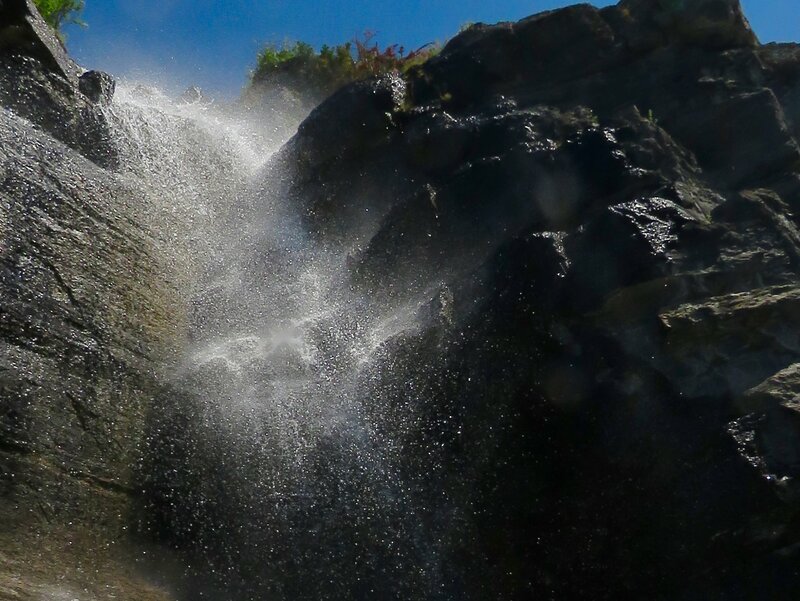 It’s essential when camping in the West’s most popular national parks, take in some fishing, and go on for a taste of Vancouver, all in time to rendezvous with family in northern California’s redwoods. More on that as we go along on this multi-part journey from Michigan. You may have already read Denise’s previously published tips on how to plan such a vaunting journey. Ready to go? The first leg begins, now! Since we keep Lucky Us in northern Michigan, it’s the perfect launch pad to head west. A short drive through the Upper Peninsula with a stay along Lake Michigan at a national forest campground near Brevort, then one mosquito-y overnight at a woodsy Wisconsin campground, and we were in North Dakota. It’s NoDak for short, by the way. And both it and South Dakota may be boring, or a drive-thru state to you, but these endless prairies have their own beauty if you allow it all to speak to you. 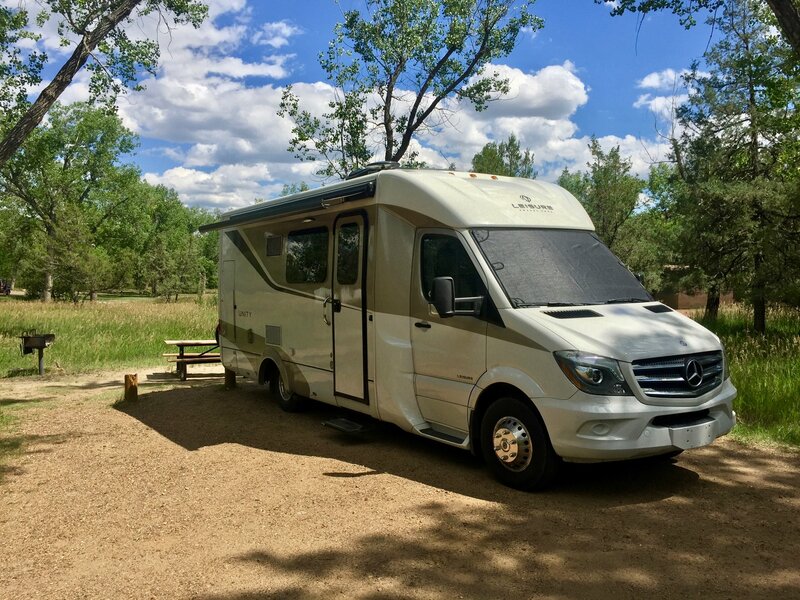 We stopped early at Jamestown Campground along I-94 so we could stay at Fort Abraham Lincoln State Park at Mandan on the banks of Missouri the next day. A re-created Mandan village in its original setting. Mandans were farmers, trading to other tribes. Lewis and Clark stopped here. 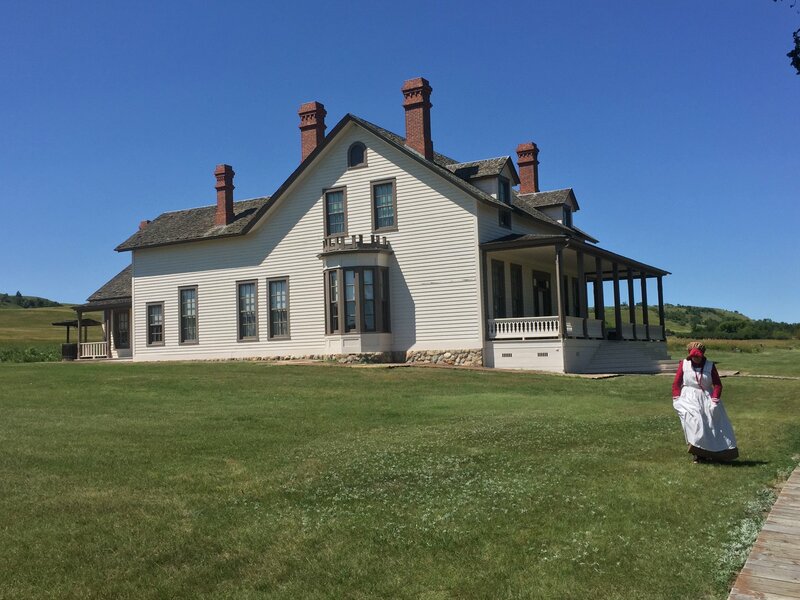 Commandant’s house, Fort Abraham Lincoln State Park, Mandan, ND. Custer left from here and his wife Libby, from Michigan, received the news of the Native American victory at Little Big Horn here. 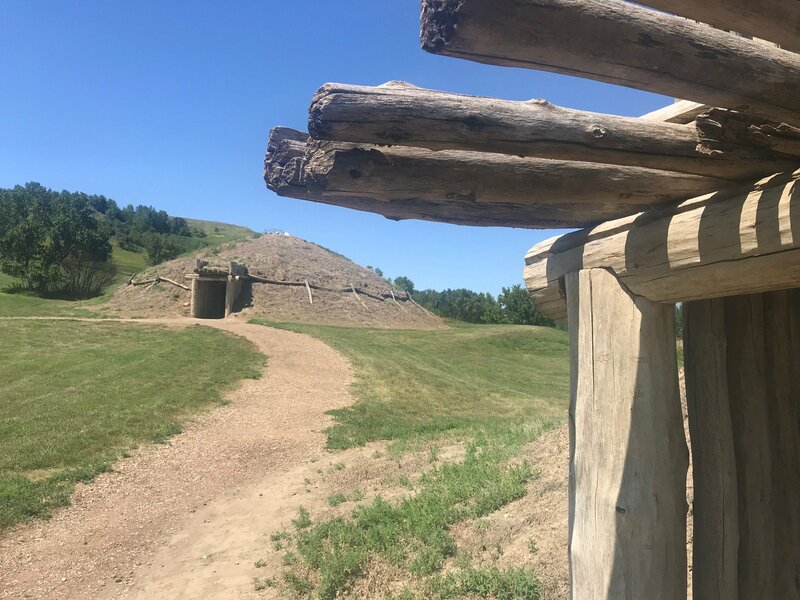 The fort is near a re-created Mandan Indian village the residents named On-A-Slant, (when you visit you’ll know why) where Lewis and Clark stopped to visit the peaceful Mandans, who grew crops to trade with other tribes, and winter nearby on their own journey west. Turns out, the route we chose would follow their own for much of the way. 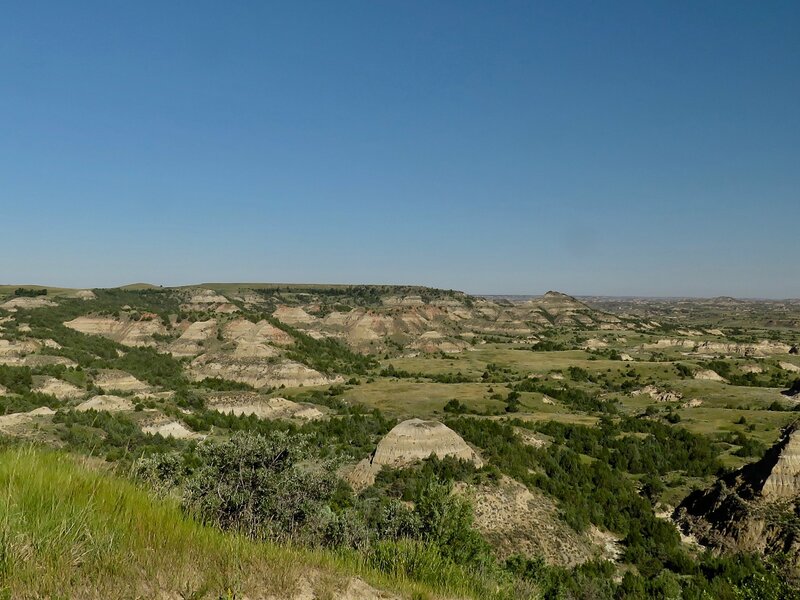 It’s also the site of what used to be Fort Abraham Lincoln, where Gen. George A. Custer and men of the 7th cavalry set off to their destinies along the Greasy Grass River, or as Europeans call it, Little Big Horn, a few hundred miles west. The fort commander’s house, where his wife Libby—who was from Michigan—got word of the Indian victory, still stands and is open for guided tours. 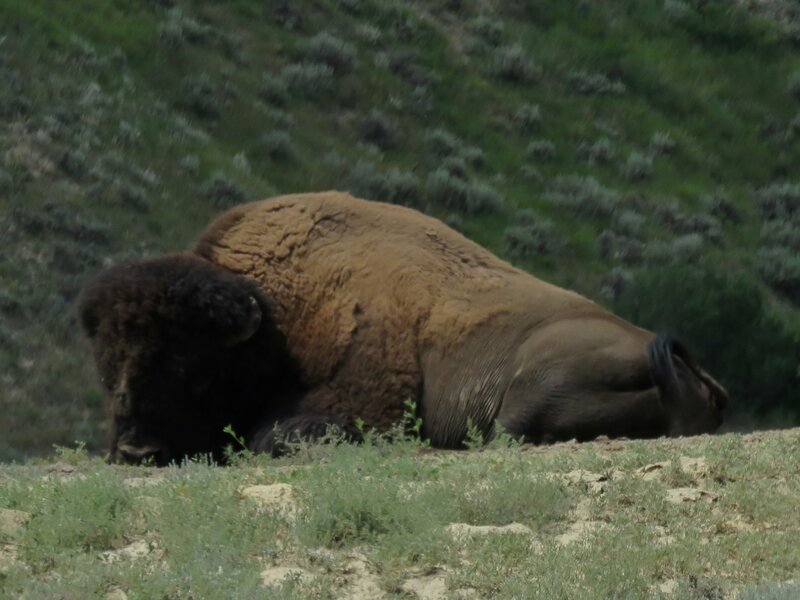 Our next night was at Theodore Roosevelt National Park, near Medora, North Dakota. Because we tried to stay here on a previous trip, we made sure to have reservations this time. Settled in at Cottonwood Campground, we made plans to take in a ranger walk the next morning before heading west. 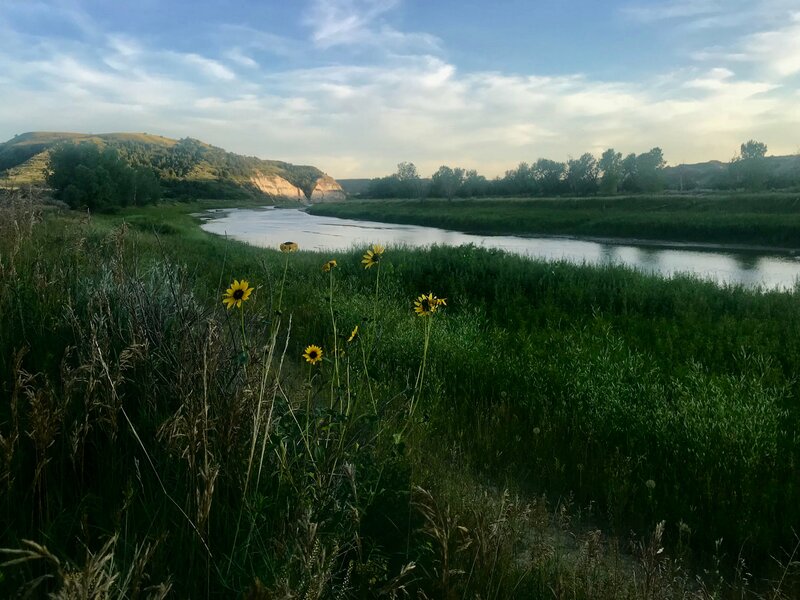 Our campsite was along the muddy Little Missouri River, which is mentioned in Roosevelt’s journals when he tried cattle ranching here. With power and nearby water, it was a great spot under the trees. 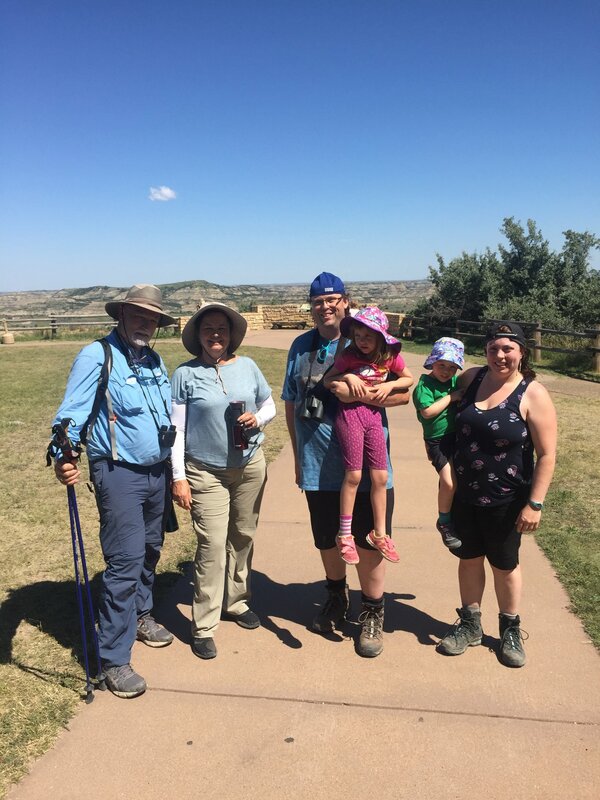 The next day, we headed to the park headquarters just off I-94 and joined the guided hike into this part of the badlands, learning how wind, fire in the narrow coal bands, and water shaped the badlands into what we saw on the trip, where Teddy may have even ridden or walked. On the hike, we met a Canadian family, and after talking about our trip into Canada, the father said he wanted to give us a small gift. 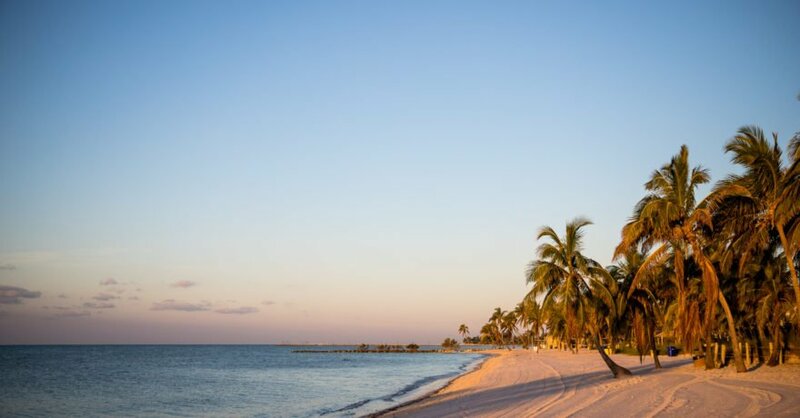 It was a time of some uncharacteristically heated words between Washington, D.C., and Ottawa, and he said they’d even questioned whether to come south for their vacation, wondering what kind of reception they’d get. They presented us with a simple gesture of cross-border friendship—a box prepared by their kids, with a sprig of evergreen, a Canadian flag lapel pin, and two chocolate “loonies,” simulated $1 Canada coins. They said they were giving one to every kind American they met. Hopefully, they ran out. We’ve still got it, minus the loonies! We stopped next off I-94 at Pompey’s Pillar National Monument on the banks of the Yellowstone River. 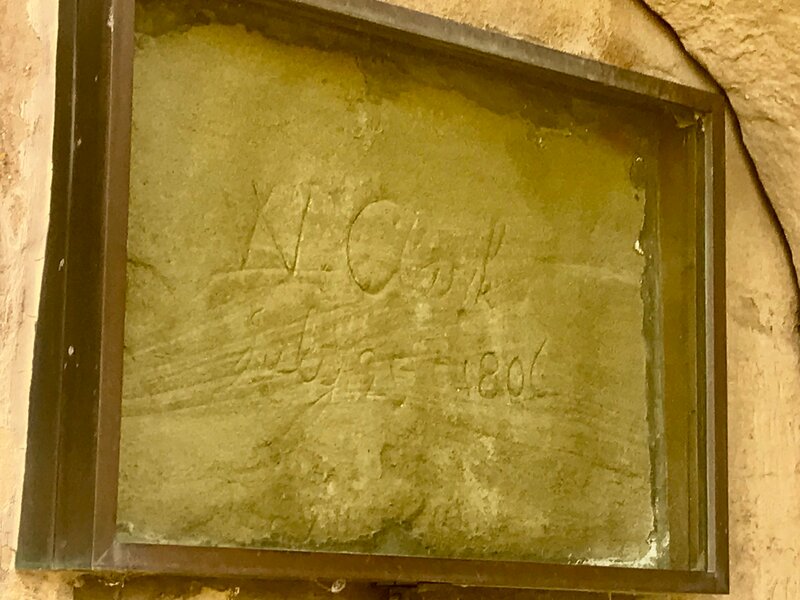 Countless wagon train travelers scratched their names into the rock, following the example of the first to do so, William Clark in 1806. Mallard’s Rest, a state-run primitive campground along the trout-rich Yellowstone River near Livingston, Mont. 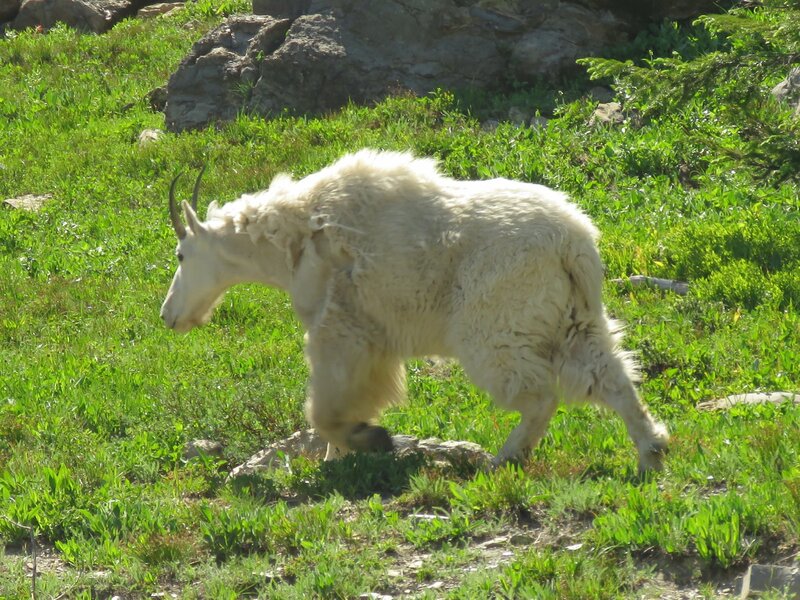 Our first night in Glacier National Park, we eased into its south boundary at Devil Creek Campground along U.S. 2 and took a short hike for a spectacular glimpse of the mountain goats hanging to the mountain’s edges at the salt lick along the Flathead River. 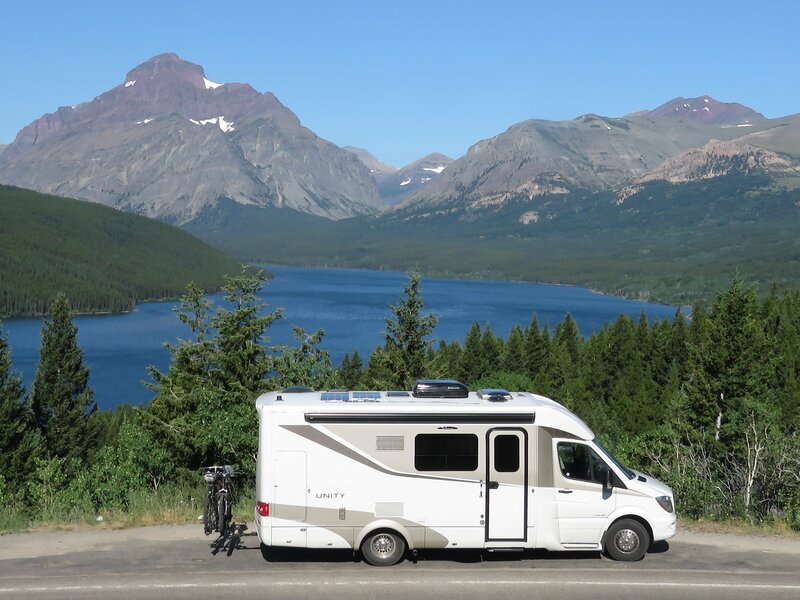 The next day we turned onto less-traveled Montana Highway 49, to be rewarded with more stunningly beautiful views of Two Medicine Lake and the mountains beyond. 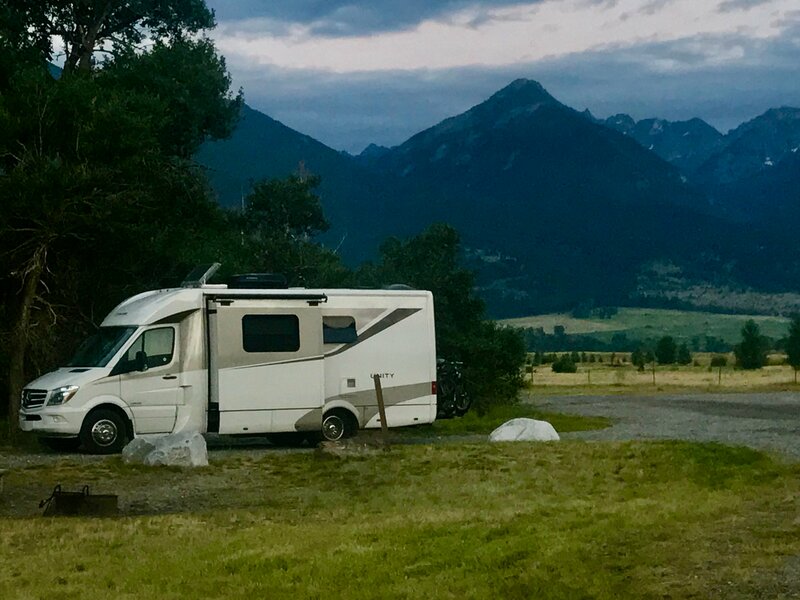 We overnighted at Chewing Blackbones Campground, run by the Blackfeet nation along Lake St. Mary, after ducking into Glacier for a short drive along the lake. Chewing Blackbones was hit-and-miss. 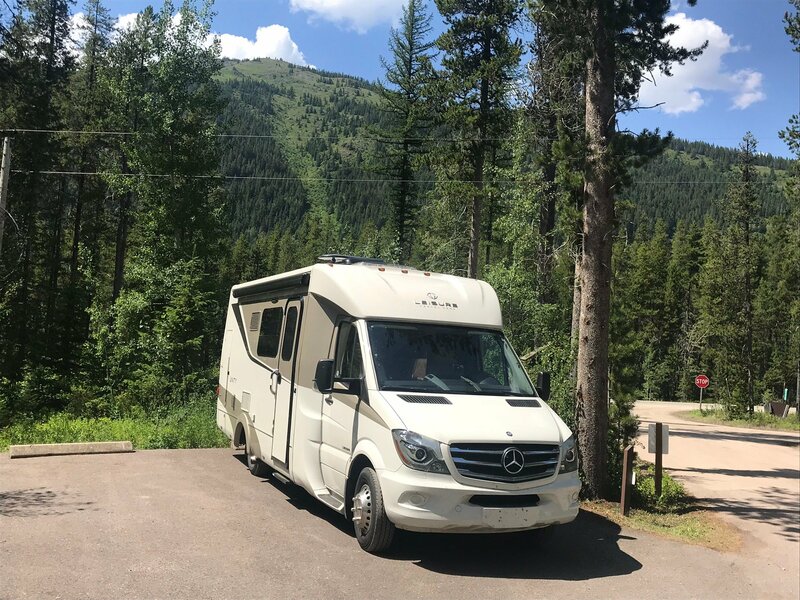 Hit because of the spectacular mountain and lake scenery and the local Blackfeet family we met camping next door, miss because finding our site was confusing, and the amenities could stand improvement. The next day we arrived at tiny St. Mary to meet our famous Red Bus Tour. 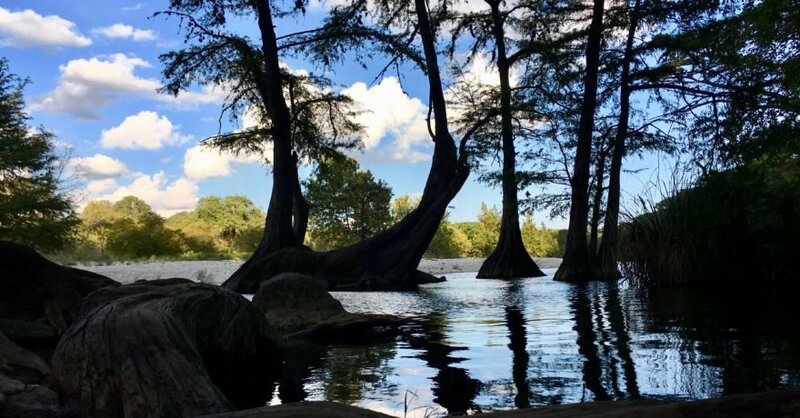 You have another writer to blame for the term “crown of the continent,” describing the route we took into the heart of this million-plus acre park. You’ll see why when you stop at Logan Pass. The glacier peaks surround you indeed like a crown. And, because depending on the way you look, the snow and ice melt from the receding glaciers you see flows west to the Pacific, east to the Gulf or north to the Arctic. You may want to plan a trip here soon, as scientists predict the glaciers may be gone in a few decades. We wanted to drive its 50 miles, but it’s open only to vehicles up to 21 feet long, and 10 feet high, too tight for even our LTV. And, some turns feature craggy, and “striking” rock outcroppings. Literally. Many times in summer someone misjudges and loses a mirror, or worse. But the buses are piloted by skilled drivers nicknamed “jammers,” because of the gear changes they used to do when the buses had standard transmissions. They’ve been updated by Ford, and are the best way to go. We reserved months before, knowing its popularity. They pull off at the best photo stops, some with “bus only” parking spots, and the roll-top roofs make it easy to get great shots, while our RV stayed where we boarded in St. Mary on the park’s east side. It’s hard to do justice to what you’ll see here. The topography nearly everywhere is straight up or straight down. By thousands of feet. Each rocky hairpin corner unveils a masterpiece. Waterfalls stream by. Weeping walls drip snowmelt onto you, followed by stunning glacier-carved valleys and lake views. 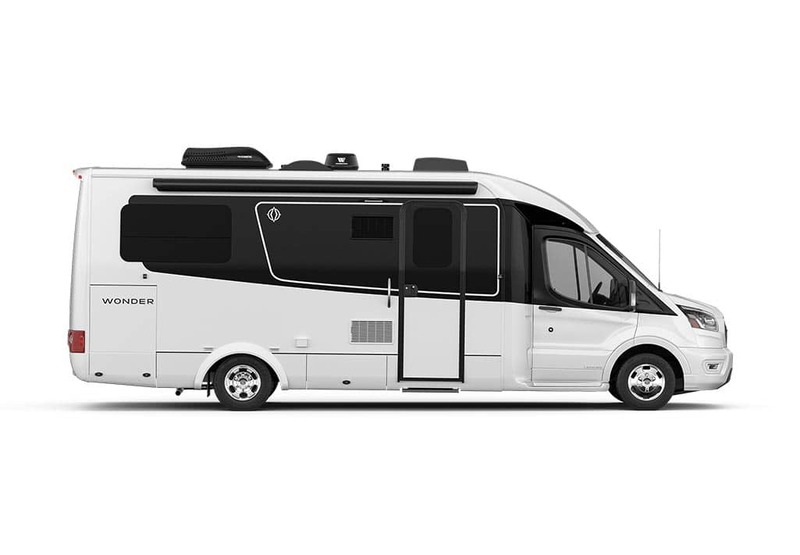 Your head swivels, as there’s a new photo around every craggy corner, with narration provided by your “jammer” driver. 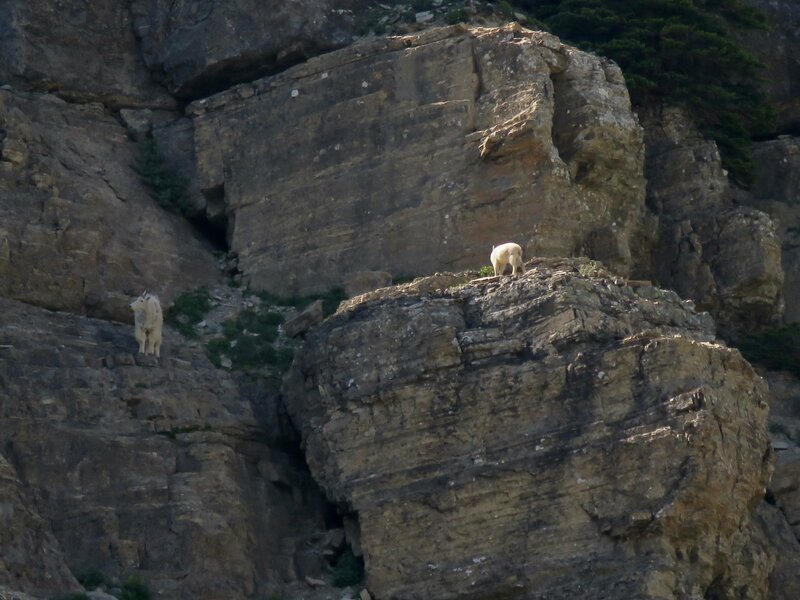 Mountain goats and bighorn sheep are common co-travelers, and hikers occasionally have a grizzly as a trail companion. At some points, visitors below you can’t even see the road above, it was so skillfully carved into the mountains between 1921 and 1932, much of it with no guard rails. A stop at Logan Pass allows you to get out and walk the trails a bit, and take in the enormity. Then it’s more winding and rock ledges and even a few tunnels through the rock, and following the river flowing to Lake MacDonald. 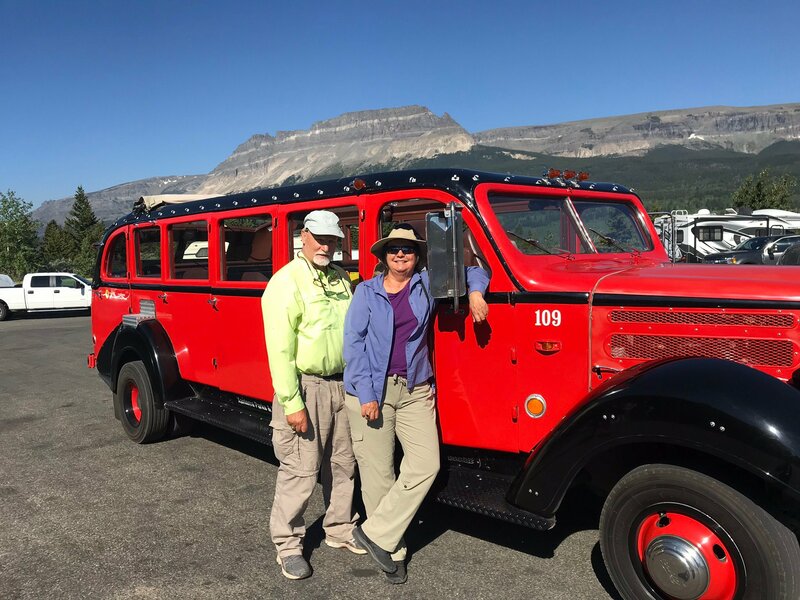 At the turnaround, the bus stops for lunch at Lake MacDonald Lodge, then heads back for more sweeping views. I’ve taken this road several times, including at night, preparing for an overnight hike from the Logan Pass area. Don’t drive this, or the driver at least will miss most of the scenery because they’ll be concentrating on missing other tourists coming at them, and avoiding the ledges and hanging rock crags trying to take your mirrors off. Take the tour instead. After staying overnight at St. Mary Campground, we drove north on U.S. 89, to our next adventure in Calgary, Alberta. We’ll detail that next. 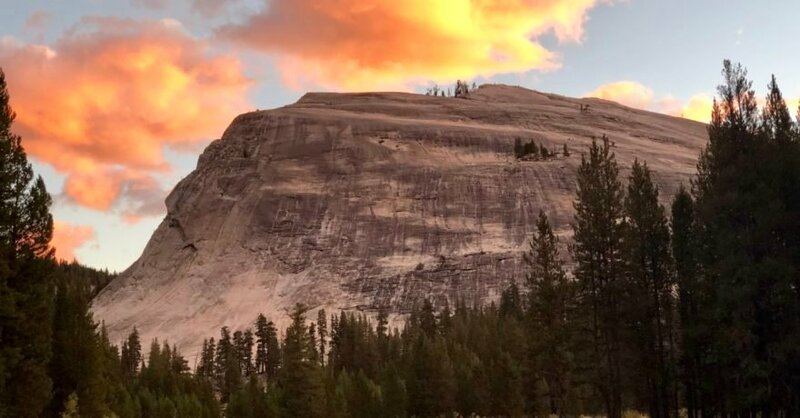 Some readers may want to go without national park campground reservations. Good luck. Make them as soon as possible, as all sites on this route fill quickly. 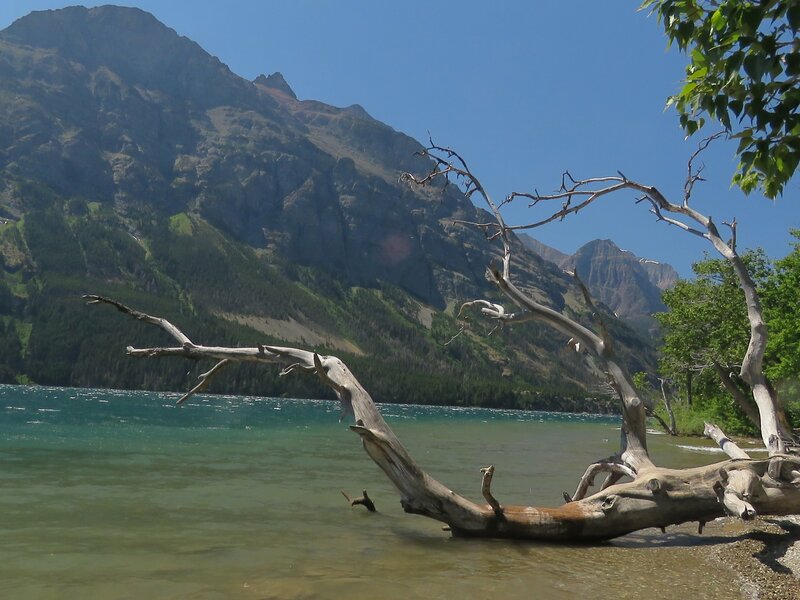 Here’s a link to Glacier National Park campgrounds. 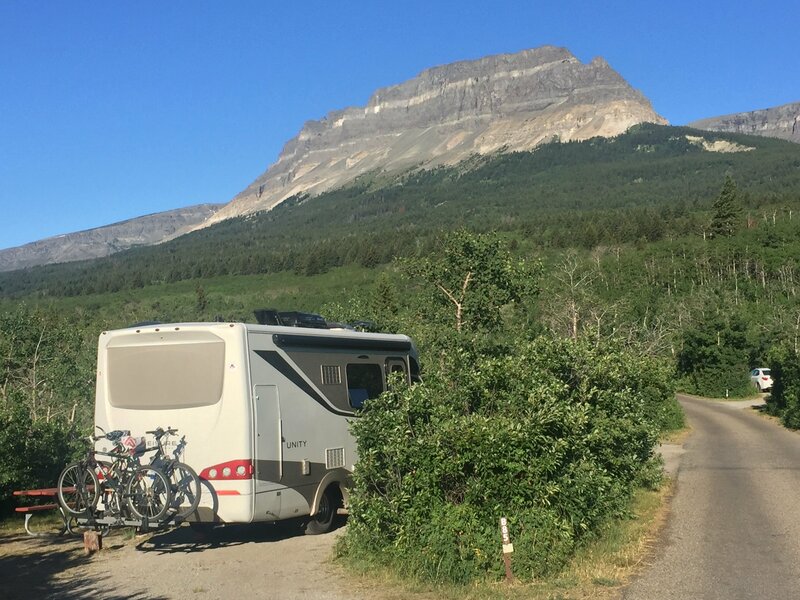 Rising Sun, a campground we wanted to stay at in Glacier, is first-come, first-served and a schedule shows you’ll be lucky to get in. Make that Red Bus Tour reservation early as well, as there is limited space for each scheduled trip. This is a grizzly bear and mountain lion country. Have bear spray on hand, available rather inexpensively at many western Costcos in two can packs.